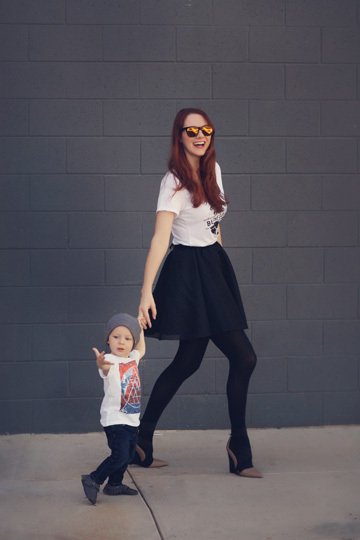 Phoenix and I are excited to participate in the “Be The Good” campaign with Jane.com and Cents of Style. We had to pick a type of service (donating for charity, doing volunteer work, paying for someone’s lunch tab, etc.). There was one specific idea that I had thought about since I first saw an amazing product on pinterest. It’s called the Upsee, and it is made by a company out of Ireland, Firefly. One of Phoenix’s good friends has sbina bifida and he’s unable to walk. He’s such an amazing little guy, between his big sweet smile, and his awesome wheel chair, our guys just love him. Their family is always on our mind, we’ve fasted for them before surgeries, but weren’t sure what else we could really do. Back to pinterest, saw this amazing product, a harness that the mom or dad wears, it connects to the child, and the little feet are attached to the parent’s big feet. The child is able to stand and walk with the adult’s support. Rad right? How amazing that there are people in this world dedicated to creating devices that can give such joy. And how much joy would this little toddler have if he could play a game of soccer, for the first time, with his siblings! I originally told them about this product, and that I found it on pinterest, but instead of leaving it up to them to do, we decided to track it down and get it for them. We can’t wait for it to come in the mail, and even more, we can’t wait to see our little friend’s face as he uses it. We’ll keep you updated on how it goes. We’re glad that we could be a part of this campaign. Fashion is fun, creating shoots can be rewarding, but I like having the opportunity to put the focus on what’s really important in life. It’s all about taking care of each other, and not just thinking about ourselves. Now we’re tagging 5 friends to #bethegood and share what they do to help others around them: Brooke White, Alex Evjan, Reachel Bagley, Jamie Bellessa, and Beth Jones. I know these ladies, and that they are already doing service on a regular basis, they’re pros, and that’s part of why I chose them. I’m sure they’ll have great ideas and an interesting perspective on serving. What an amazing cause. This is so sweet and I’m sure will be so appreciated. I can’t wait to hear how it turns out! Thanks for being part of this movement!